The Bike Doctor Frederick’s Grand Fondue will take in some of the most beautiful and challenging terrain in Frederick County. When we heard the Grand Fondo ‘National Championship’ was coming to Frederick, we were pretty excited. A Grand Fondo, those big semi-race group rides with opulent eats, cheering crowds, celeb cameos, and a go fast attitude, could bring national exposure to how good our riding really is. We have heard numerous friends say they are signed up to go test themselves against hundreds of other riders. The spirit of the ride is friendly competition, and I am sure the day will bring plenty of game faces. But at the shop we had a thought. What about a ride that is just about riding good roads, and not about killing someone on a climb? We already do these on a regular basis, but how about trying to get more people out on a like minded ride? Incentives were needed. Food. Drink. Scenery. Maybe a band. Also, a really cheap entry fee. A no-profit venture. Races are pricey. 100-150 bucks for a day of riding. What about a big ride that costs riders 15 bucks? That’s what we’re talking about! Our Grand Fondue is about eating and riding. Ride a huge ride, come back to a scenic winery in Middletown for a communal fondue cookup, and wash it all back with some Merlot and Mead. Andre, who works at our shop, is also part owner of theOrchid Cellar, a family owned Winery that specializes in traditional and contemporary meads. The Orchid Cellar will be hosting the after party, where riders can grab some food, sample some wine, and enjoy a beautiful valley overlook. The Orchid Cellar will be unveiling its 2011 Merlot at the after party. The Grand Fondue Frederick is going to be a beautiful but hard ride. There will be gobs of climbing, dirt roads, and then more climbing. Nothing will be timed, there will be no winners. It’s going to be a challenging but relaxed ride, an easy pace to ease the legs through the terrain. We’ll take in some of the finest and smallest roads in Frederick County. Even the short ride is going to be challenging, even with 1/3 of the miles and 1/3 of the elevation. Don’t worry though, even the short ride has some fantastic scenery and barely travelled roads. What: Two rides: a 30ish mile ride, hard but not super long, and a 99.9 miler, really hard, and really long. When: October 28th, the last Sunday in October. The shorter ride will leave from the Orchid Cellar at 12. Again, get there earlier. There will be a mechanic on hand if you have minor issues with your bike. He won’t have cables, housing, chains, tires or cassettes. We are talking basic stuff: tighten this, loosen that. This is a cheap event, and we wanna keep it that way. If you have doubts as to whether your bike can handle the ride, get it into the shop at least a week prior to the event. It’s hilly, and the pace will be decidedly relaxed, so it’s not like we are gunna knock this out in 2 hours. Who: The Bike Doctor Frederick and The Orchid Cellar are hosting this event. Because this is a winery, you need to bring an ID with you if you want to partake. This isn’t a 21+ event, and we have to card because of that. $15 and some cheese. Yeah, some cheese. The fondue is going to be communal, and everyone has to pitch in some good cheese to melt up. Bring some Swiss or Gruyer, about a half pound per person. We’ll cook it up so it’s ready to eat when you get back. What does my 15 bucks get me? Two glasses of either Merlot or Mead, a cool commemorative glass to take home, access to the fondue pot, and fondue based desert. We’re also talking to a few local bands about coming out to play. There will be a few sag wagons, but KNOW YOUR LIMITS. If 11,000 feet of climbing sounds like a lot, it is. The riding will be hard, even if the pace is not. There will be gravel and dirt roads. Challenges galore. Please sign up for the appropriate ride for your abilities. Remember, even the short ride will be rad! We’ll have a mechanic who is roving around, but he will be minimally equipped. What to bring: This part is going to sound preachy, but it contains the important nuggets, so bear with me. A bike with low enough gears to get you through a big HILLY ride. Water. Lots of food, including something to get you through if you start to bonk. That means Gu or some other sort of energy Gel. Appropriate clothing. We’ll be huffing up huge hills and coming down them pretty fast. Sweat+steep roads=wind chill. We won’t have spare clothing, so figure out what works and bring it. There will be very few places to stop for additional food. There will be only a few designated rest stops, and they will have minimal provisions: extra water, Gatorade, basic snacks. This is not a supported century ride. This is a big ride in the country with like minded folks. Please bring a blinkie light, if it is overcast, starts to rain, or you just get caught out in the dark, we want you to be safe. Spare tubes (2 per person), a patch kit and a enough C02 or a hand pump to fix at least 2 flats. 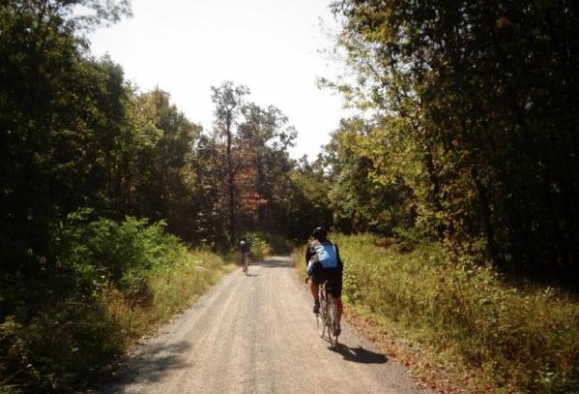 We will be on some dirt roads, so please bring a bike you will be comfortable riding on such surfaces. If it is a road bike, get some durable 25mm tires or 28’s if they fit. Ask in the shop if you are unclear on any of this. This week will mark one of the last Wednesday night shop rides with Brian. The evening riding season is winding down, but he’ll be back in the spring, making you suffer on the big climbs! Join us for the season closers this week and maybe maybe next week. Wheels down at 5.30 from the shop. Thursday evenings, while the light lasts, join the Flying Dog team for the Watershed shop ride. Call the shop for details. Wheels down, 5.30. This Sunday, join us for the evening shop ride. Wheels down at 5.30 from the shop. Last week was epic. If you missed the story, head over to our facebook page to bear witness. This week we’ll be heading to Middletown for some dirt and a big fat climb back over the mountain. Less miles than last week, but no less ouch! You need to bring a really good headlight and a bright tail light. We will be out after dark! 40ish miles. Casual pace but lots o’ pain. Tuesday Morning, join Andre and James at the 7th street Starbucks. We drink some coffee, starting at 8, then go hurt ourselves on some big climbs until the early afternoon. Casual pace, but big rides. Sounds great! Could you post a route map, please? CGM, we published a map of the shorter rides, but the longer ones are still pending finalization. If you follow the link at the top of the blog to ‘breaking news about the Fondue” you’ll come to the route maps. If and when we post the big guy, it will be there too!